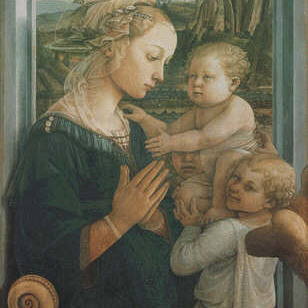 Fra Filippo Lippi (1406-1469) was one of the protagonists of the Florence art scene, during the second half of the 15th century. He was the master of Sandro Botticelli, and father of Filippino Lippi, another painter that we meet at the Uffizi. In the Lives, Vasari tells that Filippo entered the Carmelites monastery, in the Oltrarno district, when he was 8. In Santa Maria del Carmine – the Carmelites’ church – many years later, his son Filippino completed the famous Masaccio’s frescoes of the Cappella Brancacci. In 1421, Filippo became friar: for this reason in Italian he is called Fra Filippo. During the 30’s he moved from Florence to Padua. According to Vasari, during a short trip by boat, Lippi and some friends have been kidnapped and enslaved by the Moors. One day – after more than a year – Filippo made the portrait of his master on a wall, using a piece of coal. Moors did not know painting: they considered Filippo’s art a miracle, and released him. In 1437, Lippi came back to Florence and opened his own workshop. In the following years, he worked for many important Florentine families and even for Palazzo Vecchio. However, it is known that he was involved in some trials and he had several economic problems. In the 50’s the big scandal of Filippo’s life took place. During these years he worked in Prato and became chaplain of the monastery of Santa Margherita. The legend says that – while he was working at one of his paintings depicting the Virgin Mary – Filippo asked the mother superior for a nun who could pose for him. Lucrezia Buti posed for him. They fell in love and Filippo “kidnapped” Lucrezia, during a procession. The couple moved to the painter’s house, in Prato. Lucrezia, as Filippo, had been forced to enter the monastery when she was very young, because of the poverty of her family. In 1457 Filippino, their first son, was born: he was followed, some years later, by Alessandra, their daughter. Filippo and Lucrezia had taken vows, so they were living in sin: their condition was considered very scandalous. Thanks to the Cosimo il Vecchio intervention, pope Pio II dissolved their vows, but they did not marry. The painter portrayed many times his love in the sweet feminine figures that characterized his works.